Shirts With Random Triangles: Nick Saban gives recruits 111 reason to commit to Alabama via awesome recruiting poster. Nick Saban gives recruits 111 reason to commit to Alabama via awesome recruiting poster. Alabama has been sending out the above poster of the football jerseys of players who played for Crimson Tide head football coach Nick Saban during his career as an HC that went on to be selected in the NFL Draft. 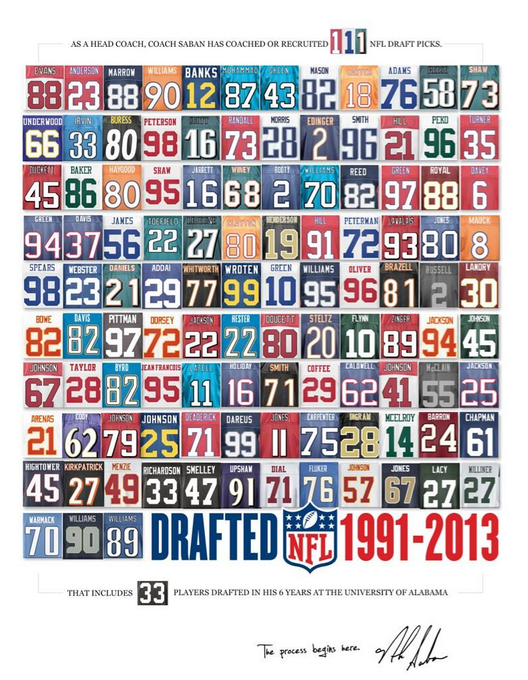 "That includes 33 players drafted in his 6 years at the University of Alabama," the poster notes. Saban also signed the poster, adding "The process begins her." Not only is this poster a powerful piece of recruiting , it a pretty darn good looking one as well. This is the kind of thing you'd want to have framed and put on the wall even if you decided to go to another school. It's also something a lot of regular Alabama fans (and even non-Bama fans) would probably die to have as well.